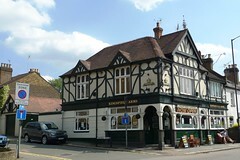 Greene King pub in Harrow. Slightly shabby, but has friendly staff and locals. A pint of Hogsback T.E.A was £3.50 in June 2015; there were a couple of other real ales on tap. No food as far as I could see. TV showing sports with the sound turned off; there was some not-obtrusively-loud 80s cheese playing. Not terribly busy. Accessibility: A small step to enter. Last edited 2015-06-14 16:16:18 (version 2; diff). List all versions. Page last edited 2015-06-14 16:16:18 (version 2).